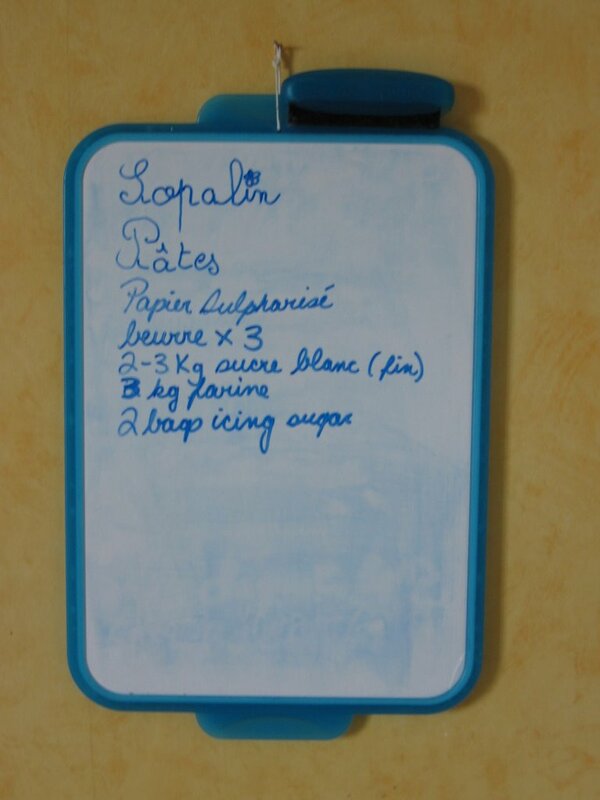 In a desperate effort to wrangle our grocery bill under control, Franck and I have instituted a note board system in the kitchen, where we mark what we need to buy during the next foray to E. Leclerc. We are NOT allowed to buy anything not on the list (i.e. oooooh look, the Petit Ecolier biscuits are on sale!) , and even the items on the list are cause for lively debate most of the time. I have to admit this system is saving us quite a bit of money, particularly as it prevents me from, in the throes of a big grocery store headspin, wondering “do we have any mustard? I love my mustard…I think we may be running out…maybe I should pick up a bottle…maybe two as life undoubtedly isn’t worth living without mustard…” and then returning home with three jars of mustard to add to the five we already have stored in the pantry. As long as I have known him, Franck’s hand-writing has been full of portent and mystery, being a cross between egyptian hieroglyphics and the greek alphabet. I have become so used to being unable to decipher it that I stopped trying many moons ago, and certainly don’t bother to try and read which items he has written on the note board. I, on the other hand, have always been proud of my unfussy yet emminently legible writing style. So yesterday when we were cleaning up the lunch dishes I was completely shocked when Franck’s hand left the message board after marking down two new items to buy; I could actually read what they were. Not only that, but the items were noted down in the loopy, lush cursive that eight year old girls favour. I laughed so hard I had to sit down, and Franck, struggling to maintain his dignity, explained that he was trying to write better so that Charlotte, who is learning to read at the moment, doesn’t follow his bad example. Unable to fight an irresistable urge, I got up and added a daisy above Franck’s perfect little “i”. To prove his point Franck called Charlotte into the kitchen and she read the items “Sopalin” (paper towel) and “Pates” (pasta) perfectly. She also commented that the little flower was a nice touch, which Franck took credit for, and most smugly too. Then Franck pointed to items I had written below, and Charlotte squinted for a moment. This entry was posted in Uncategorized on October 20, 2006 by admin. Yesterday when, after lunch, I accompanied Charlotte, who is now in CP (Grade 1), to her classroom door the girls in her class were in a complete froth. “Charlotte, Charlotte!” they milled around her. “Augustin isn’t in love with you anymore! He kissed Camille (not my Camille, thank god) during La Recree!” And this wasn’t all; the rest of the salient details were quickly doled out. “He kissed her on the mouth!” Solene shouted. “Three times!” added little Margaux. “In the cabane!” (this is the plastic playhouse in the school playground – apparently a popular spot for romantic rendezvous). I looked over and spotted Augustin, a gorgeous little heart-breaker with dark fringed chocolate eyes, standing beside his newest “amoureuse“, his hand protectively on her knee. As for Camille – that little vixen – she was perched on the window ledge, playing with a stringy lock of hair and smiling a decidedly self-satisfied smile which was rendered particularly striking by the fact that she was missing her two front teeth. No doubt about it; she definitely had the look about her of a girl who had been kissed three times in the cabane. As soon as Franck and I got wind of this “amoureux” talk last year we laid down the law at the dinner table. 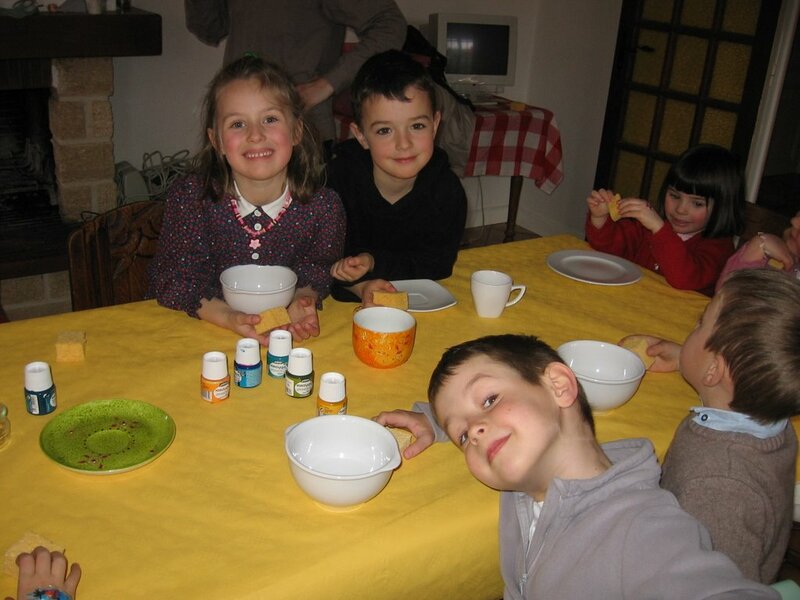 Charlotte was far too young to have an “amoureux“, we declared, and would be until she passed her Baccalaureat (this last part was Franck’s contribution). Yet the persistent chants of “amoureux” still surrounded Charlotte and Augustin in the school courtyard. Sometime near the end of last year, I began to notice that Augustin, even though he kept coming back to Charlotte, was a rather capricious sort. From time to time he would ditch Charlotte, and declare himself “amoureux” of another girl, even (quelle trahison!) Charlotte’s best friend Anne-Louise at one painful juncture. Out of Franck’s hearing, I tried to impress upon Charlotte that, even though she was far too young to have an amoureux, when the time did come (of course after she had her Bac, as per her father’s instructions) she should think twice before deciding on a boy like Augustin. I tried to explain the meaning of “fickle” and explained why a boy like Augustin was not a good choice for any self-respecting female. I don’t know a single woman that hasn’t had a nasty experience with the type of man who loves her one day, moves on to somebody else the next, and then comes back the day after – reeling you in and out like a fish on a line. Indeed, during my adolescence I despaired at the idea that perhaps there were just no men out there with two of the traits I valued the most; constancy and loyalty. I was thoroughly fed up with guys who made me feel like I never knew where I stood, but that’s all I could ever seem to find. And then I met Franck, who made it clear from the first evening we met that he wanted to be with me – no conditionals, no changes of heart, no playing mind games. The irony that I had to come to France – the country of philandering men – to find such a person was not lost on me. Yet, I realized with no small sense of relief that, contrary to my previous assumptions, there were men out there who were as constant as I was, so there was therefore simply no reason to put up with the other kind. But after imparting this convoluted life lesson to Charlotte I had serious doubts that any of it had sunk in, or even made any sense to her. So yesterday it was with inordinate pride and a definite sense of accomplishment that I watched my daughter respond to the clamouring girls. “Why should I care?” Charlotte declared stoutly, hands on her hips. “I’m totally not in love with Augustin anymore. Anyway, I’m much too young to have an amoureux.” (note to self – must remember to break open the champagne with Franck in celebration of this last bit). With this, she promptly joined in the merciless teasing of Augustin and Camille with the rest of her classmates. This entry was posted in Favorite Posts on October 9, 2006 by admin.